A national museum of artefacts related to farming and country living over the past 150 years, with a huge collection of tools and equipment, plus a vast historical archive. 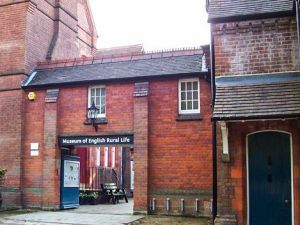 The museum was founded in 1951 by the University of Reading, and over the ensuing decades has amassed the largest single collection of objects related to agriculture in Britain. The museum was founded at a time when old farming practices were being transformed, traditional equipment was discarded, and changes in rural life were accelerating at a pace never before seen. The museum's scope is enormous, taking in the broad sweep of farming practice, tools, and social history surrounding agriculture. Its mission is to preserve a memory of the past in the British countryside and challenge perceptions about rural England, exploring the historical and contemporary relevance of country life. Interactive galleries delve into questions of identity, environment, technology, culture and health in rural England. There are over 25,000 objects in the museum's collections, including carts and wagons, traditional crafts, ploughs, baskets, hand tools, dairy equipment, sewing machines, and smocks. The museum is about much more than the tools used in traditional rural activities; fascinating interactive displays focus on the stories of the very real people who used them. One special exhibit holds nearly 1000 brasses from West Country Friendly Societies. The societies were village clubs that provided mutual insurance benefits to members. Each society had its own unique brass, which was affixed to a pole and carried around the village in an annual ceremony. There are over 600 baskets in the collection, plus basket-making tools. Over 200 of the baskets come from a local basket maker named Emily Mullins, but there are Victorian baskets, and baskets for diverse purposes like fishing and industrial use. See tools used to turn bowls, work leather, and make lace, and more tools used by stonemasons, blacksmiths and carpenters. There truly is something covering just about every aspect of traditional rural life. Visitors can also access the museum archives, which hold documents from personal journals kept by farm labourers to the records of large agricultural firms. Many of the archives can also be searched online from the museum website. You can book a guided tour, and there are regular special events and temporary exhibits. Location: Opposite the Royal Berkshire Hospital, just off the A4. On site parking.